Pop quiz: who on the roster is projected by ZIPS to lead the Padres in home runs and have the 2nd highest OPS? If you answered Matt Kemp, go ahead and punch yourself in the nuts. It is none other than new fan favorite Jabari Blash (Wil Myers is projected to have an OPS a smidge higher than Jabari). When I started the #JumpOnTheBlashwagon movement, it was formulated first and foremost as a good bit, but also as a beacon for beaten down Padres fans to cheer for in a down season. Plus, maybe, JUST MAYBE, Blash can provide some sorely needed power and production for a team that may be lacking in offense. When you’re facing a season of bad Padres baseball, sometimes it’s nice to have a little project to root for. After all, this is how we created the legend of #NORF. We created Will Venable, #PadreForLife. We rooted for Rod “Shooter” Beck to get 20 consecutive saves. We rooted for Jason Lane when he made a couple starts and completed an incredible comeback story. We can watch noted music video star Tommy Medica just barely miss the team’s first cycle. Things might look bad in the standings, but there are always little things we can cheer for to keep the season fun. And Jabari Blash is that thing for 2016. Sure, he’s a Rule V pick. But he’s not your typical single A player that didn’t catch on with their previous team. Blash is a 26 year old who completely DESTROYED the pitching in AAA last season. Like averaged a home run every ten at bats DESTROYED. That’s a McGwire/Bonds at their peak type ratio. Let’s not forget that Jabari Blash is an original AJ GUY ™. Blash was drafted by the Rangers in 2009 during Preller’s tenure, but didn’t sign. Now AJ gave it another try in the Rule V draft, which gives us Blashphiles some real hope that he might stick on the roster. And why not? Unless you think broken down slap hitter Jon Jay is the answer in LF, there isn’t much blocking Blash from getting a fair audition. Blash is your classic power hitter: big power and big swing and miss. He has a hulking frame at 6’ 6”, hit 32 HRs last year, but had a 25.9% K% last year. In 2014, he struck out 30.2% of the time. Just as a comparison, Brett Wallace struck out 29.0% of the time in 2015, Justin Upton struck out 25.6% of the time, and Melvin Upton struck out 27.2% of the time, so Blash’s K% wouldn’t be alone on this roster. Fangraphs had a long write-up last year on Blash likening his AA season to one by Paul Goldschmidt. Chris Mitchell of Fangraphs actually said Nelson Cruz would be a good comp when discussing Blash’s progression. And it’s not uncommon to see some power hitters not get their first shot until 26ish. Just look at Josh Donaldson, Mike Morse, or the aforementioned Cruz. Meanwhile, ZIPS sees Blash as the most likely source of power on this roster, projecting 21 HRs in 442 at bats. In the field, scouts have said he’s not a great route runner, but he has a plus arm (Kiley McDaniel said he had a 55-60 arm). Ideally, the less than ideal route running would be somewhat mitigated by using him in LF. While Blash strikes out a ton, he also has been excellent at getting on base, largely due to a high walk rate, over 12% last season. Across his career, he has largely seen an OBP exceeding .350. And lord knows the Padres could use some on base skills. Blash isn’t a classic power hitter that can only hit fastballs also. Chris Harris, director of media relations for the Biloxi Shuckers in AA, noted that in 2014, Blash was seeing about 75% off speed pitches, and still crushing them. The main concern for Blashphiles is that Jabari has had a very poor track record in Spring Training. Small sample size and all, but he went 1 for 9 last year in Seattle’s camp. That’s the kind of performance that can lead to a Rule V guy getting cut in a roster crunch. Luckily, Jabari came into camp early and sounded ready to work during his 1090 interview with Darren Smith. 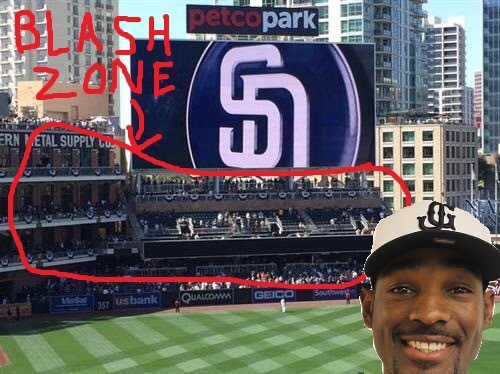 We certainly can’t understate the sheer joy of making hashtags for Jabari Blash will bring to the Padres fanbase in 2016 as well. So far we’ve got #BlashWagon, #BlashGordon, #BlashZone, #BlashDahlia, #JaFARi, etc. These are the types of little projects that can bring fans together in a bad year. So let’s everyone go ahead and #JumpOnTheBlashwagon. He’s the Padre we need, he’s the Padre we deserve.